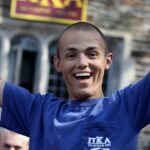 Shave for Schreiber, Buzz for Bobby is an annual philanthropy event hosted by Pi Kappa Alpha fraternity at Duke. It is put on to raise funds for the Bobby Menges’ “I’m Not Done Yet” Foundation, which helps cancer centers at various hospitals across the nation. In addition to raising money, brothers also shave their heads in support for current cancer patients and to honor two past brothers of Pike, Mark Schreiber and Bobby Menges. Over the past three years, we have raised over $180,000 dollars and are looking to raise another $60,000 this year, bringing us close to a quarter of a million dollars. This is the fourth edition of the event, and as it expands and becomes more popular, we hope to keep having support of the Duke community and of all people that have been affected by cancer in any way.